If enabled, users in the same community can see each other regardless of OWD. 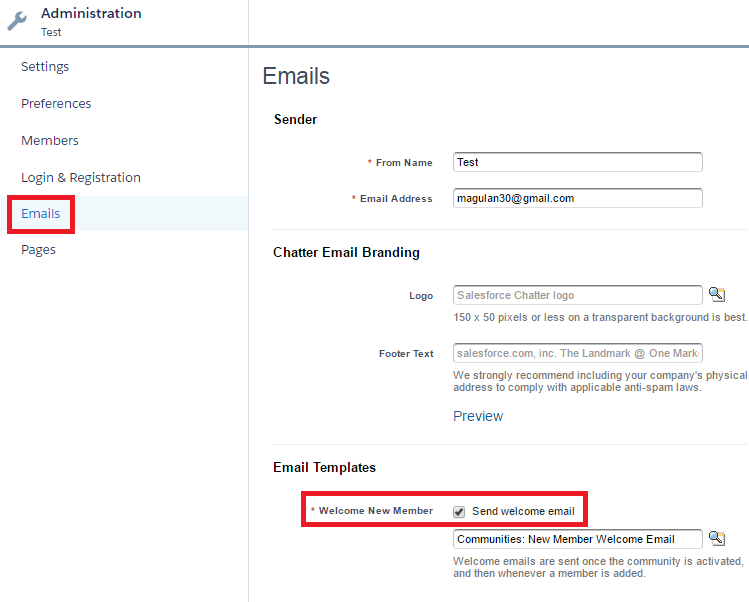 How to upgrade templates in Community Cloud in Salesforce? By default, users with the Manage Articles permission can perform all the actions like edit, delete and publish. To restrict access, first, create public groups containing article managers and then use this page to assign the groups to specific article actions. Using this Article Actions page and Public Groups to manage permissions is only applicable to Knowledge in Salesforce Classic. Permissions in Lightning Knowledge are managed via Profile permissions. 3. What are all the advantages of FuseIT Explorer? 4. 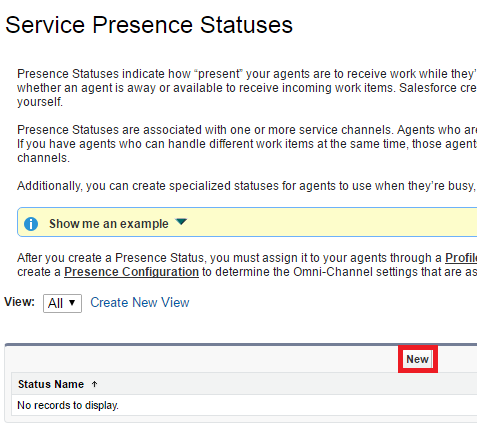 How to increase Salesforce custom object limitation? 5. 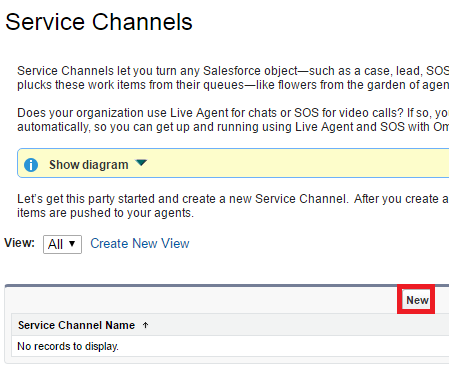 How to query all private reports in Salesforce? 6. How to delete files attached to FeedComment after deleting FeedIComment in Salesforce? 9. 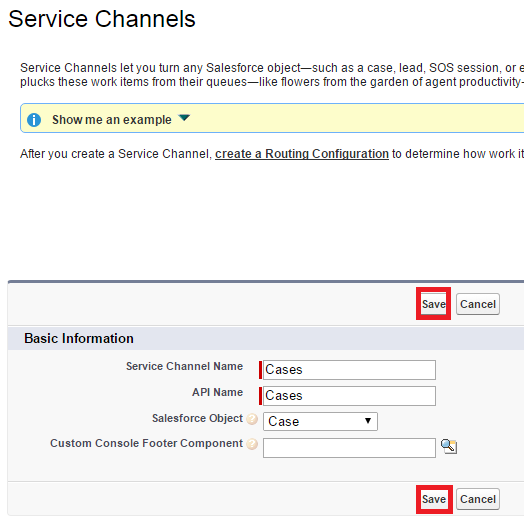 Disadvantage of Quick Create in Salesforce? It doesn't enforce required fields or trigger validation rules. 14. 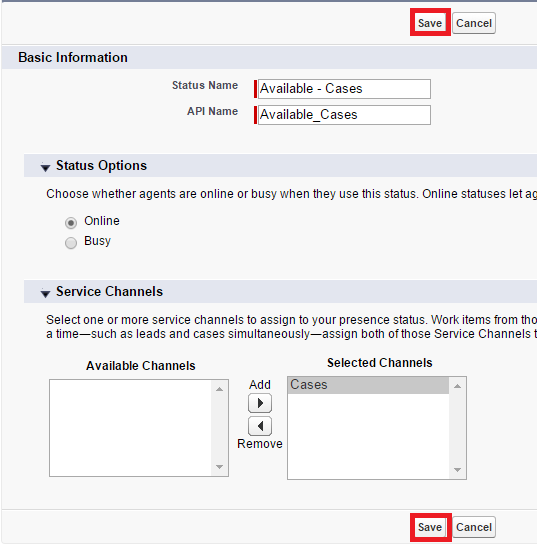 How to Embed Flows in Visualforce Page? To add a flow to a Visualforce page, embed it using the <flow:interview> component. To set up Governor Limit Email Warnings, check the below steps. 1. 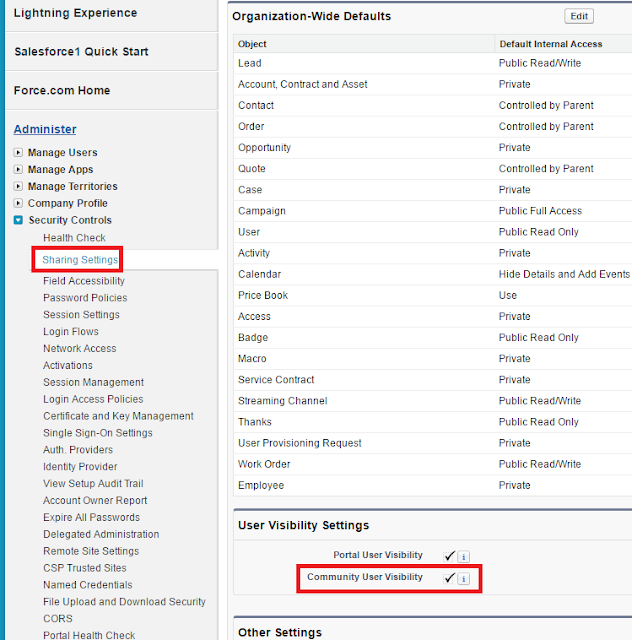 Log in to Salesforce as an administrator user. 2. From Setup, enter Users in the Quick Find box, then select Users. 3. Click Edit next to the name of the user to receive the email notifications. 4. 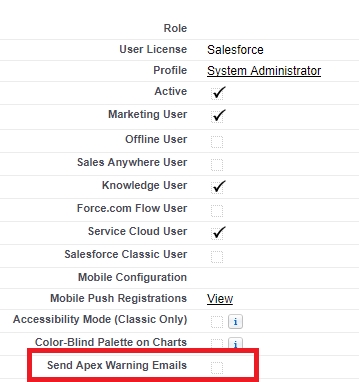 Select the Send Apex Warning Emails option. You can specify users in your organization to receive an email notification when they invoke Apex code that surpasses 50% of allocated governor limits. 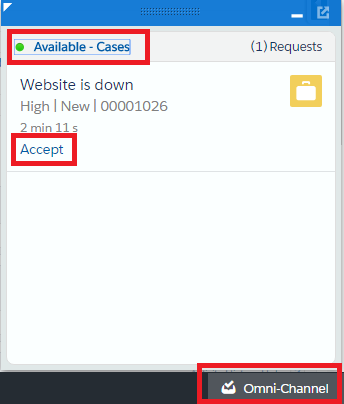 When you create a request usage notification, you specify an administrator to receive an email notification whenever your organization exceeds a specified limit for the number of API requests made in a specified span of hours. 1. 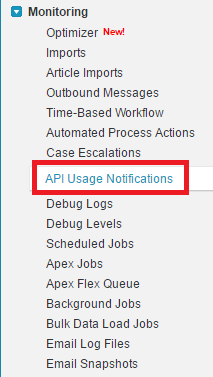 Go to API Usage Notifications. 3. Select the system admin who should get the notification and save it. Once the threshold percentage is exceeded, a notification is sent once per the number of hours specified, until the limit is no longer exceeded. Maximum 10 notification requests can be added. In order to avoid System.QueryException: Aggregate query has too many rows for direct assignment, use FOR loop, make sure the sub query is limited. If the sub query returns more records, we get System.QueryException: Aggregate query has too many rows for direct assignment, use FOR loop exception. 2. 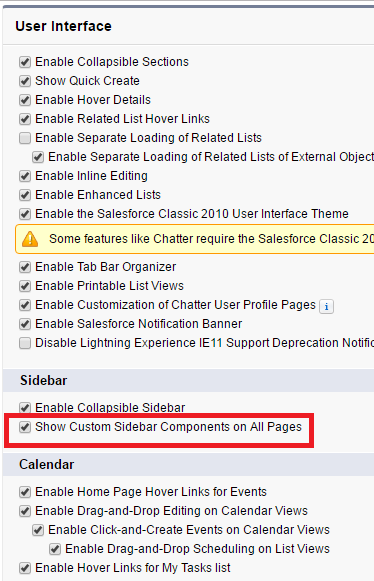 Enable Show Custom Sidebar Components on All Pages. 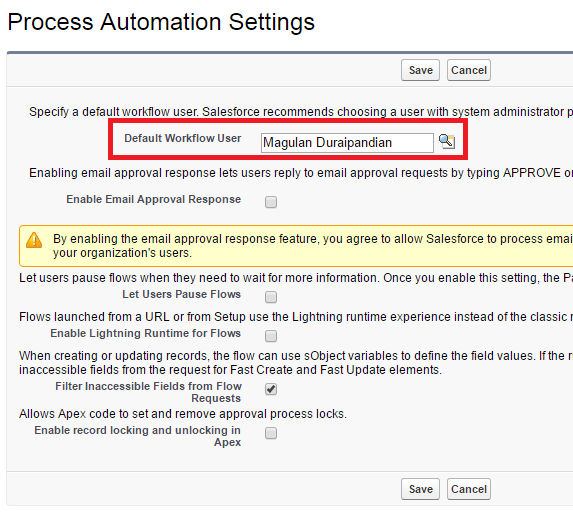 How to deploy process builder using Apache ANT Tool in Salesforce? 1. 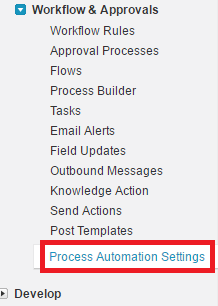 Go to Process Automation Settings. 2. Set the Default Workflow User. 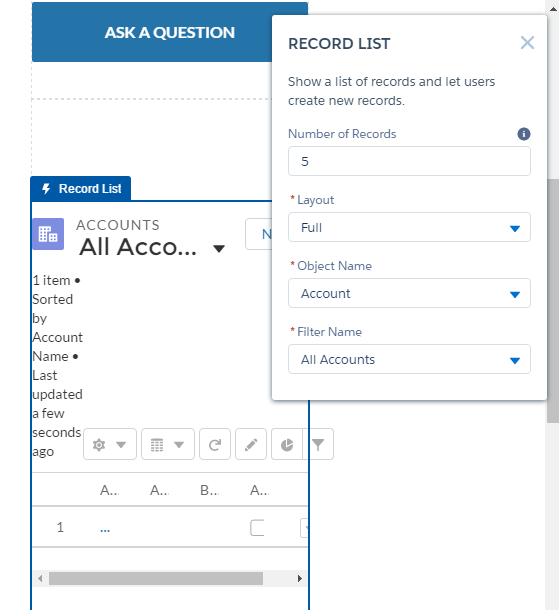 How to add Record List component in Salesforce Community Builder? 1. Drag and Drop Record List component. 2. Set the properties for the component. 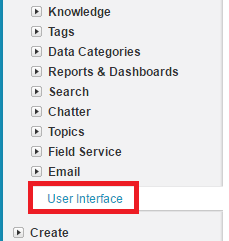 How to enable Sub Topics in Salesforce Community? You can hide subtopics in Community Builder. Go to the Page Editor, and select the Topic Detail page. Choose the Headline component, and in the Property Editor deselect Show Subtopics. How to mention multiple test classes in RunSpecifiedTests in ANT in Salesforce migration? Omni-Channel is a comprehensive customer service solution that lets contact centers push work to their agents in real time. Omni-Channel lets you create work items from your Salesforce records―including cases, chats, leads, and custom objects―and route them to the most qualified, available agents in your organization, all in real time. 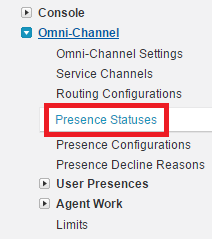 Omni-Channel integrates seamlessly into the Salesforce console, so it’s easy for your support agents to use. With Omni-Channel, you can manage the priority of work items to make sure that critical assignments get taken care of quickly. You can manage your agents’ capacity and availability for work to ensure that they’re given only the number of assignments that they can handle. 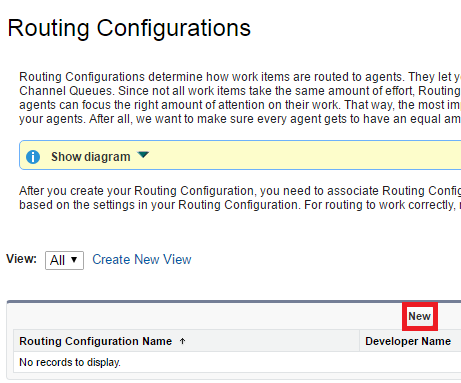 You can also define which agents can work on different types of assignments. 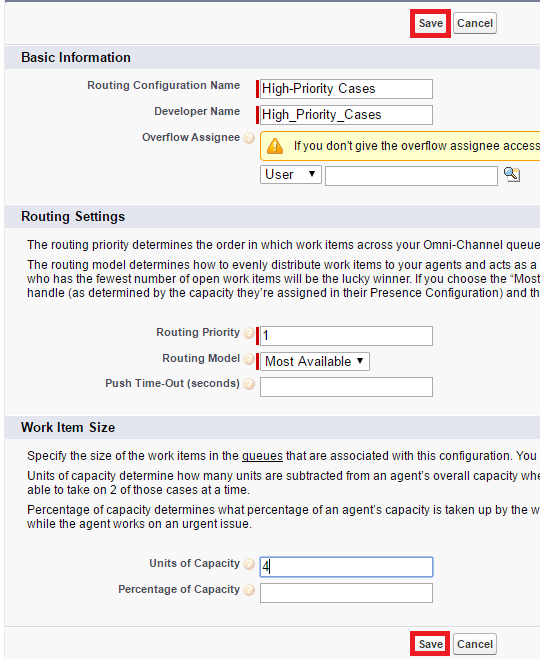 Best of all, Omni-Channel routes all of these assignments to the correct agents automatically. Agents no longer have to pick and choose work items manually from a queue, and managers no longer have to triage or dispatch work to agents. Work is served to the most qualified available agent in real time! 1. 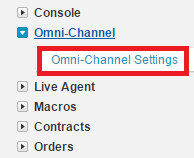 Go to Omni-Channel Settings. 3. 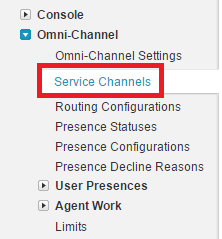 Go to Service Channels. 5. Enter the information and click Save. 6. 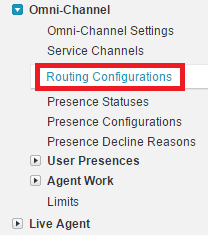 Go to Routing Configuration. 8. Enter the information and click Save. 9. 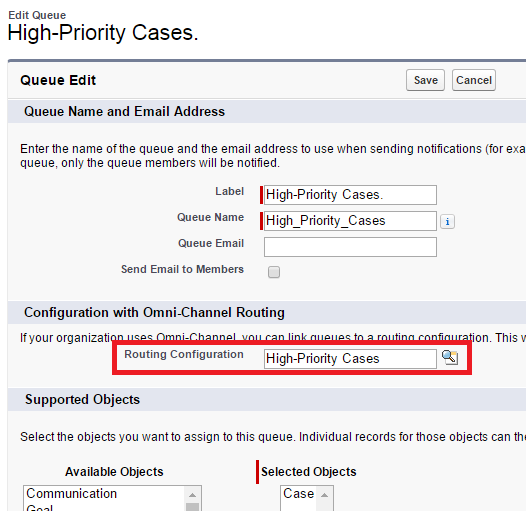 For testing purpose, create a queue with the name High-Priority Cases. 10. Go to Presence Statuses. 12. Enter the information and click Save. 13. Go to a profile where you want to test. 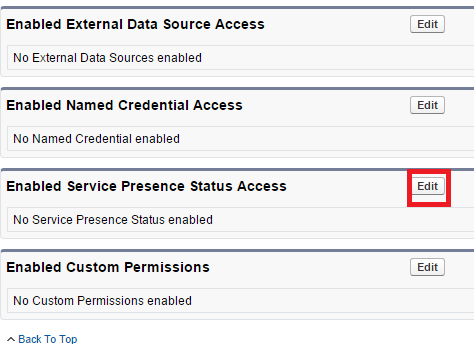 Click Edit in Enabled Service Presence Status Access. 14. 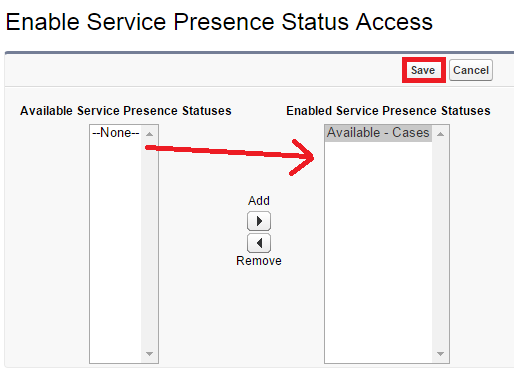 Save Enable Service Presence Status Access. 15. 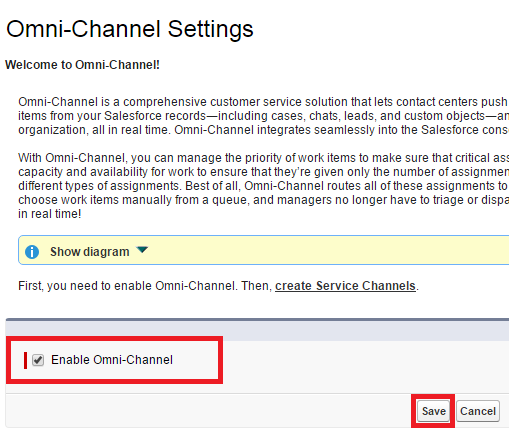 Edit a Console app and Add Omni Channel Console Component Salesforce. 16. Open the console app. Create a case with priority High. Change the owner to High Priority Cases queue. Accept the case. It will change the owner as you. 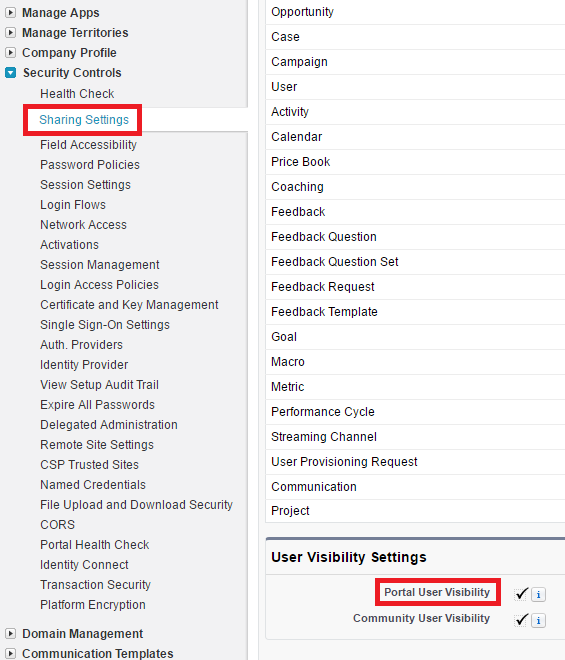 If enabled, portal users in the same customer or partner portal account can see each other, regardless of the organization-wide defaults.